Herc watch brand was founded in 1998 by two friends — Raymond and Jason. They have developed the original design for their watches, that is unusual and at the same time modern. For several years two friends have been collaborating with many watch brands and as a result they decided to release exclusive watches, the design of which would attract everybody's attention. Raymond and Jason use several methods to achieve not only the excellent design but also the perfect quality of their products. 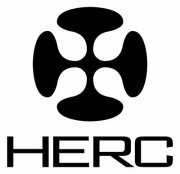 Since 2010, Herc company has been cooperating with Golcherus, a watchmaker from New York and a founder of Glitterati firm. Golcherus is also a talented designer and he has been working in the watch industry for many years. In cooperation with the founders of Herc watch brand, Jason and Raymond, Glitterati Chrono watch collection was released. It is a unique collection, consisting of watches made of stainless steel with the case diameter of 44 mm. The many-coloured dials are protected by the scratch-resistant sapphire glass. There are some models with the silver dials and golden indexes and hands. The straps are made of genuine leather, there are also several models with steel bracelets. The water resistance is 3 ATM. The watches from Glitterati Chrono collection are equipped with Japanese quartz Miyota OS21 movement. Herc company released a collection of sports and classic chronographs known as DCT Chrono. The wrist watch cases are made of stainless steel or gold-plated pink steel. The glass is scratch-resistant sapphire crystal, indexes and hands of some watches are covered with luminescent coating. The straps are optionally made of rubber or genuine leather. There are also some models with stainless steel bracelets. Herc watch company also produces classic and sports wrist watches, men's and women's skeletonized watches. All models are equipped with Japanese quartz movement. The company presents a wide range of round, rectangular and square watch cases, as well as a rich colour gamma of watches for ladies. Some models are decorated with Swarovski crystals. The original Herc watch with the exquisite design will certainly emphasize the bright personality of its owner and will be a clear confirmation of his delicate taste.